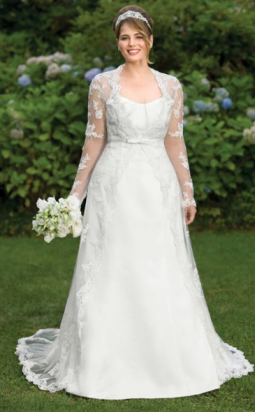 Are you a plus size bride searching for wedding dresses with sleeves? Excellent! Are you looking for simple wedding dresses with an A-line skirt? Even better! Are you looking for vintage inspired, unique wedding dresses with an open neckline? Jackpot! 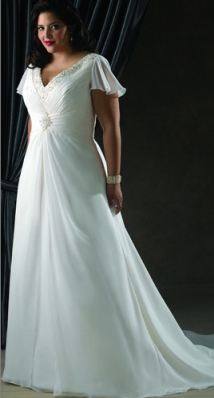 These are all styles that flatter the full figure bride. So you are on the right track if you are looking for wedding dresses with sleeves, A-line skirts and open necklines. And if you have been trying on dresses, looking at magazines and getting advice from your family and friends, it can become overwhelming and downright confusing knowing what is flattering and what isn't. The key for any woman, even plus size women, is to create a balanced silhouette while accentuating your positives and minimizing your negatives. So when you try on that corset wedding dress you have had your eye on, ask yourself or your entourage if you look proportionate. Your goal is to create an hourglass silhouette. Here are some tips that are not body shape specific, but are recommended or not recommended for ALL full figure silhouettes.Your goal is to elongate and slenderize your figure and create balance between your top and bottom. 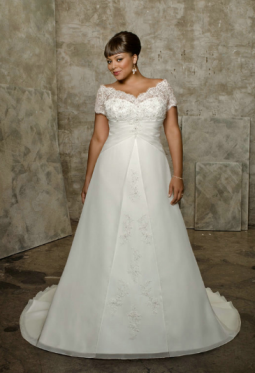 Here is a rundown of plus size bridal gowns and looks you should say "yes" to and "no" to. And wedding dresses with sleeves makes the "yes" list. Light, long sleeve jacket or shrug that can be worn over the dress. Sometimes called a bridal jacket. Anything that runs in a vertical line (e.g., long colored ribbon, vertical beading, embroidery or lace, etc.). Stiffer, structured fabrics (satin, silk dupioni and taffeta) that are easily ruched, ribbed, creased, folder, pleated or laced. Wear a corset or girdle to take off inches in your mid-section and create that hourglass figure. Buy the size you are today, not the one you hope to be on your wedding day. Accentuate your waist or create a waistline with a waist sash. They can be simple or elaborate. She is wearing a bridal jacket over a strapless gown. Also, I don’t understand why women go bridal gown shopping without looking the part of the bride. What I mean is you should spend the time to do your makeup, wear shapewear, bring high heels, style your hair similarly how you would like to wear it the day of your wedding. This all adds to the beauty of the gown you are searching for and will give you a more complete look. I am not saying to go to a salon and spend money, but do take the time to spiffy yourself up first. Come prepared! Fabric that clings to the widest part of your body or any other problem area. Strapless gowns (tends to accentuate and widen shoulders and arms). 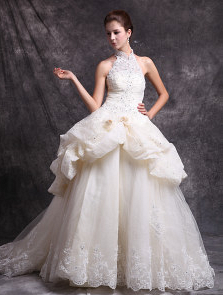 However, cap sleeves and straps can be added to a gown that is strapless. Anything that runs with a horizontal line (this will visually widen the body). Large bows, flowers, or ruffles. Plunging necklines (if you have a large bust this will make you look top-heavy and rounded). Heavy, thicker fabrics or added fabric to the skirt (this will add bulk to your silhouette). Buying a smaller size than you are. This will make the dress cling to you in all the wrong places. It is easier to take in than out. 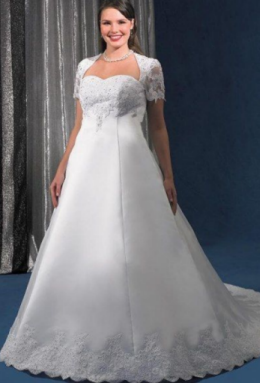 So when you are shopping for wedding dresses with sleeves and other styles, keep these in tips in mind so you will look beautiful on your special day. I guarantee it will help you narrow down your search and keep stress at bay. Finally...best wishes for a happy life together!